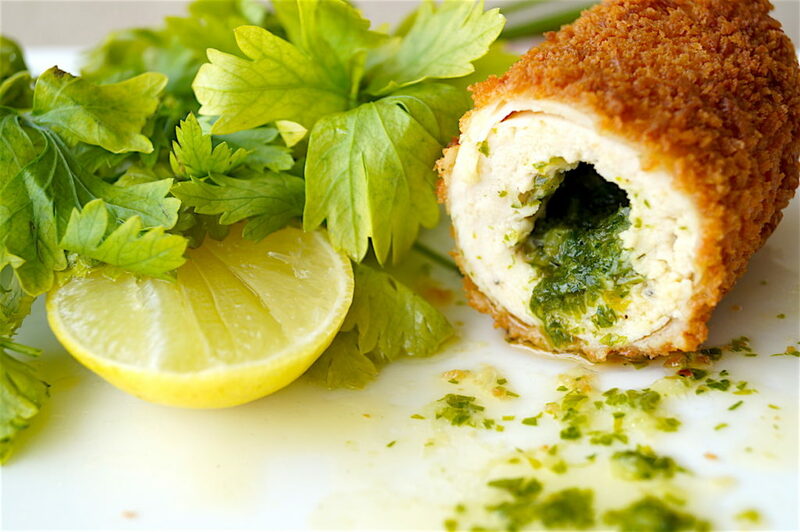 Anyone in India who’s had any association with Calcutta/Kolkata and its famous continental food restaurants such as Mocambo’s, would have heard of or tasted Chicken a la Kiev. 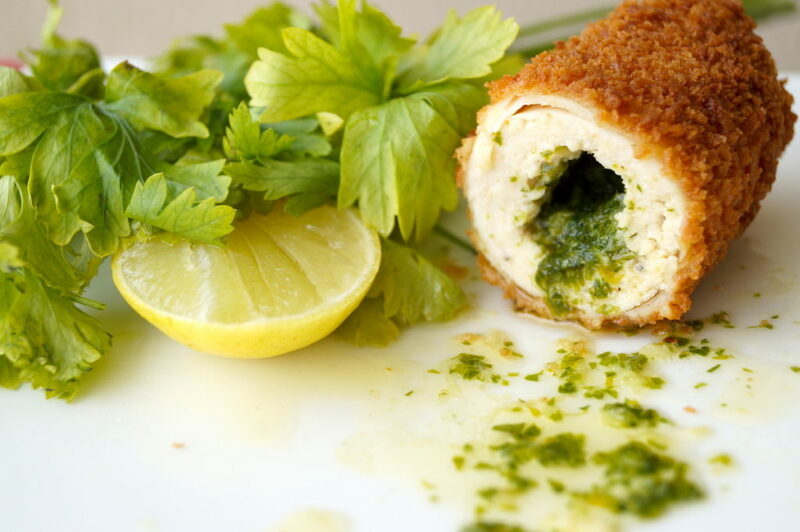 It may be made a little differently there, but the dish is essentially a chicken breast, stuffed with garlic parsley butter, breaded and fried. It’s got clean, simple, subtle flavours but is absolutely delicious. It’s quite a popular dish all over the world, but despite its Ukrainian name, its origins are debated between the Russians and the French. Ah well, whatever.. I’ll just enjoy the dish. Ironically, all these years I never went for it and on a trip to Russia last month, I tried it for the first time – having taken a bite off my mom’s dish in a lovely restaurant called Panorama in the city of Vladimir – and loved it. Then I thought, why not make it myself? And so I did. The first time it came out very well, then I said, “let me blog it”. You can just guess what happened with that attempt. The third time, very good friends of ours came over for dinner to eat this after I’d crowed to them about the dish. 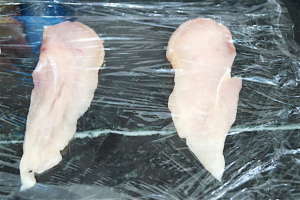 I made the large size ones, using the whole chicken breast in the shape of a ball. I fried them for a minute, put them in a 400°C oven and after 10 minutes thought I saw all the butter leak out. So I pulled them out of the oven, rested them a bit, and served them. As one of my guests cut into hers, she found the middle raw and pink! I apologised profusely, took all the Kiev’s back, shoved them into the oven again for another 10 minutes – luckily, only one Kiev was cut into. Then was the even more ridiculous part where the Kiev’s were sitting on everyone’s plate but no one was allowed to cut into it for the next 10 minutes until my signal as they had to be rested. God! if it were anyone else other than these dear people I would have died of embarrassment, but they’re totally chill and once they got the go-ahead, they really enjoyed the dish. My earlier fears were unfounded and the butter was intact in them. One of them when cut into had the butter sprouting out like a fountain! Lesson, keep the fat ones in the oven for 15 to 18 minutes. 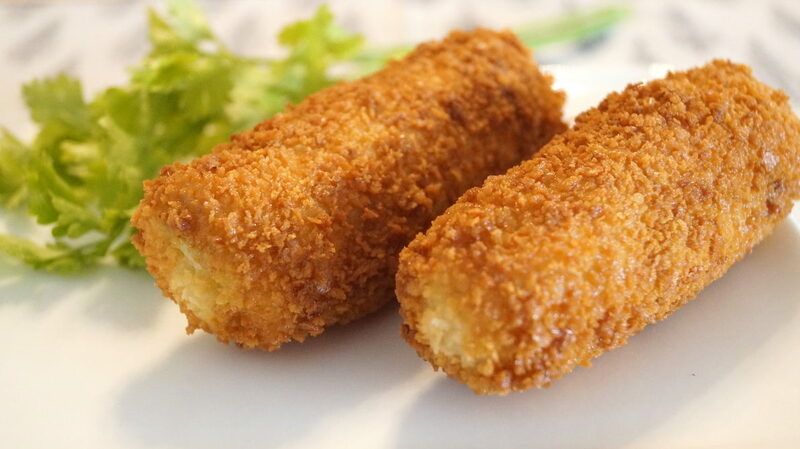 Anyway, to make things much simpler, I decided that the best, most convenient and fool proof way was to make mini Kiev’s and fry them all the way. I sliced each chicken breast into two and made smaller rolls. That way you can eat less! I fried them for 5-6 minutes in medium-hot oil and rested them for about 10 minutes before cutting them open. Success! This dish, while seeming quite simple with the bare minimum ingredients is quite tricky to cook, simply because of the fluidity of the butter stuffing, so one has to follow my instructions in the important notes section after the instructions very carefully. You can have it with a salad and mashed potatoes or steamed vegetables. It’s a pretty heavy dish so don’t make too many things alongside it. Let the main dish shine. 1½ heaped tbsp flour + ½ tsp salt. Mix and spread on a dinner plate. 1 egg whisked in a large bowl. If you want really juicy chicken meat follow this first step. Soak the chicken breasts for two hours in a litre of water and 1½ heaped tablespoons of salt. After two hours, drain the water and wash off the meat with fresh water. Then keep it on a sieve till most of the excess water drains off. Can pat dry with a clean absorbent napkin. 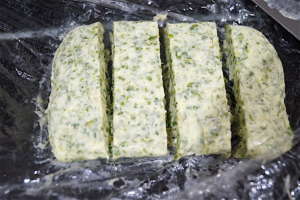 Soften the butter and mix in the finely chopped parsley and garlic paste. Mix well and turn it over on to a sheet of cling film. Shape it into a rectangle about 2 inches wide, 3 inches long and 1 cm height. Wrap the cling film gently over it to keep the shape and put it in the refrigerator till it hardens up. Can keep this for one and a half weeks in the fridge. 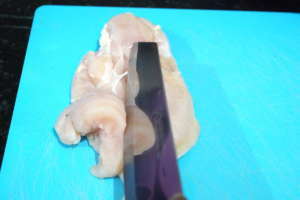 Clean the chicken breasts of all fat and cut off the extra flap under them (check pictures below). Remove the top cling film cover on the chicken, cut a 1cm wide, long strip of the butter and place it width wise on the the top of the widest part of the chicken. Roll the chicken tightly over the butter till you get to the end. 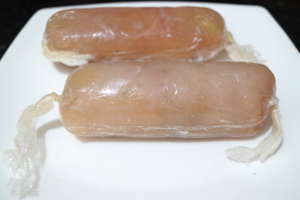 Wrap the chicken roll tightly in clingfilm and twist the ends nicely sealing the two ends well and refrigerate for at least two hours. Can even keep it overnight. 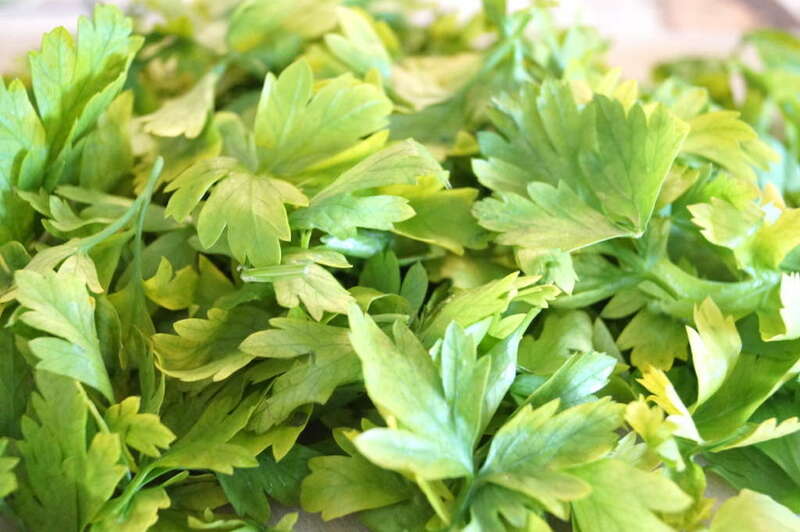 When you’re ready to fry, heat about half a litre of oil in a wok or a saucepan on medium. 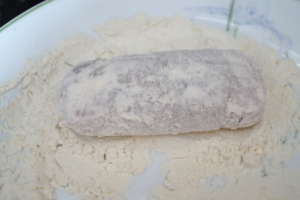 Remove the cling film covers on the chicken, first roll it in the flour, making sure to coat every bit of the roll. Then coat it with the beaten egg and then the breadcrumbs. You can keep the crumbed chicken in the fridge for 15 minutes before frying if you want, or if you think the butter inside has gone soft. Fry them on medium to medium-low heat (so that the outer covering doesn’t burn) two pieces at a time, for at least 5 minutes, rolling them on all sides to get an even colour all over. Then remove the rolls and place them on a plate covered with an absorbent napkin to soak up the excess oil. Rest them for 10 minutes so the the chicken meat absorbs the moisture. Serve immediately with a nice salad or grilled vegetables. 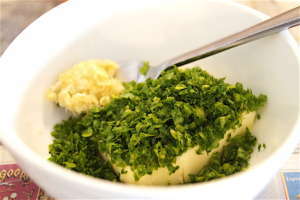 Cut into the chicken and watch the delicious garlic parsley butter ooze out. Enjoy! Important notes: Make sure there are no holes in the chicken that the butter can seep out of while cooking. Cover up the holes with another layer of finely pounded chicken and wrap the chicken up tight in cling film, making sure to seal the two ends tight. Coat the chicken very well all over, especially the sides, with the flour, egg and breadcrumbs so that there’s no exposed parts the butter can leak out of. 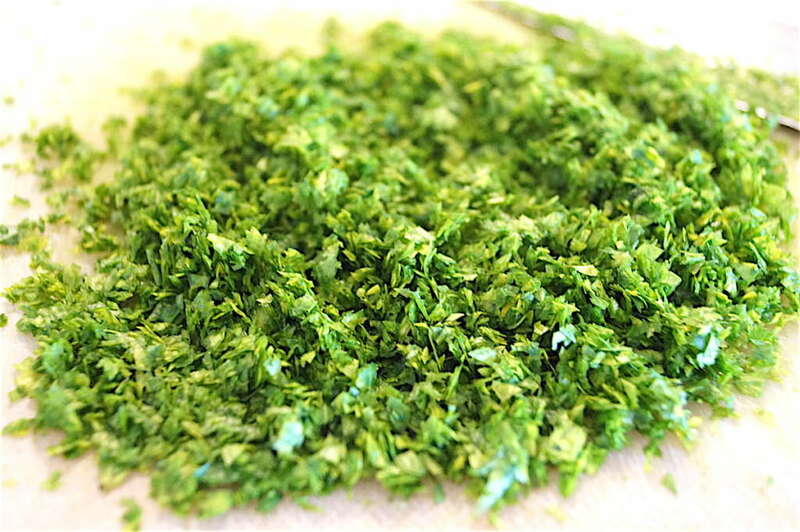 Chill the parsley butter very well so that its easy to wrap the chicken around it without it melting and oozing out the sides. 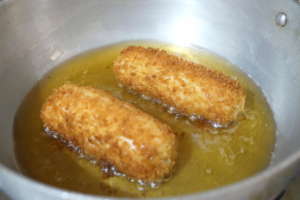 Fry in medium-hot oil. Do not let the oil get too hot, else the outer covering will burn and go black. Keep it at a steady medium to medium-low heat depending on the intensity of your hob. 1. Mix the garlic, parsley and butter nicely. 2. 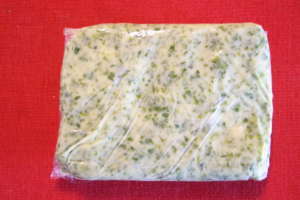 Make a rectangle on cling film, wrap gently and store in fridge till it hardens up. 3. 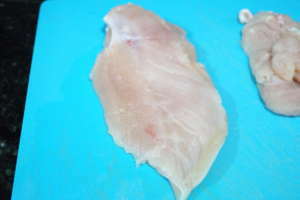 Cut the undersides of the chicken breasts off and keep aside for use in something else. 4. The chicken breast should look clean. 5. 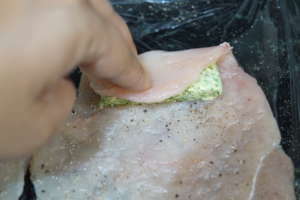 Slice the chicken breasts horizontally in half along the side seam. Place both parts on a sheet of cling film and cover with another layer of cling film. 6. Bash the chicken with a meat tenderiser or flat bottomed pan or rolling pin till about 2 mm thick. 7. Cut the chilled butter into fourths. 8. 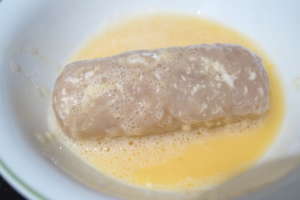 Remove the top layer of cling film from the chicken, place one piece of the butter on the top widest part of the chicken width wise and roll the chicken tightly over it. 9. Wrap the chicken rolls nicely in cling film making sure to tightly seal the sides so that there’s no chance of the butter oozing out. Refrigerate for at least 2 hours. 10. 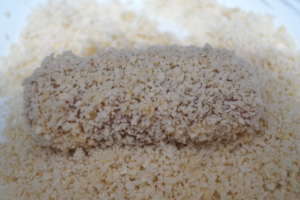 When ready to fry, roll the chicken in flour, coating every inch of it. 11. Then roll it in beaten egg. 12. Followed by breadcrumbs, leaving no spot exposed. 13. Fry on medium heat for 5 minutes turning all over for even browning.